This salad is such a fresh vegetable salad. If you are looking for more substance, add some pasta; I love it without just as well. Toss with vinegar and oil or Girard’s Greek salad dressing. 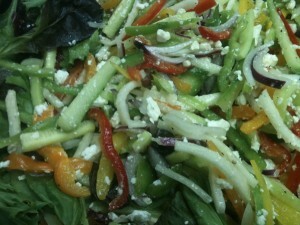 This entry was posted in Salads and tagged Bell Peppers, Cucumbers, Feta Cheese, Kalmata Olives. Bookmark the permalink.